HUV Robotics Bioloid Accessories are back! Our good friend Jon Hylands has finally returned to producing his widely popular 3rd party Bioloid add-on & accessory boards, and they are now in stock and ready to ship! We have had a huge demand for these and many people were disappointed when production was stopped, but we and surely many others will be glad to have them back. The Bioloid USB Bus Board provides a transparent and simple connection to the AX-12+ Bioloid Bus. 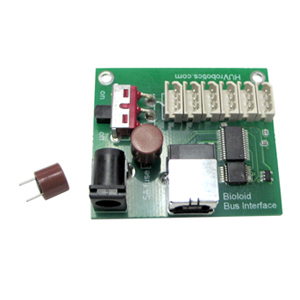 This board allows your PC to communicate with Bioloid bus devices (AX-12, AX-S1, IMU, etc) using a USB cable (not included) at speeds of up to 1.0 Mbps. 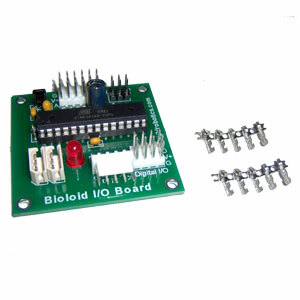 This Bioloid I/O board gives your Bioloid robot the ability to connect to almost any analog (0-5 volt) sensor. It includes 6 analog inputs (10 bit resolution on each). It also includes four general digital I/O pins, and can drive one or two DC motors using either locked anti-phase or sign magnitude PWM. 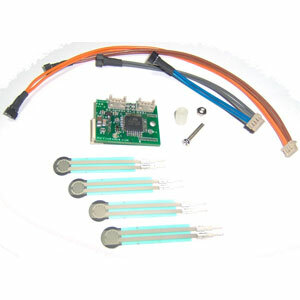 This Bioloid Foot Pressure Sensor includes one board, four .2″ FSR pressure sensors designed to be attached to the Bioloid foot, and the wiring necessary to connect the sensors to the board. Pressure sensors on the bottom of your biped’s feet will allow the robot to sense whether or not it is in balance if it is on a smooth flat surface. The arbotiX Robocontroller has been a hit so far in the robotics community! We’re starting to see projects popping up that take advantage of this awesome new controller, and specifically a few quads have caught our attention in the TRC, so we figured we’d share. Here is forum member Sthmck’s quadrapod robot progress so far, which showcases a robot built using the Bioloid system and autonomously reacting to input from some Sharp IR sensors. Some great progress so far and we can’t wait to see more! On a side note: We’ve been a bit quiet lately because we’re in the process of moving to a much larger facility where we can build bigger, better robots! We’ll get caught up soon.